You are here: Home / Market Trends / Robolution: A Blessing or a Curse? One of the most discussed topics nowadays is Industry 4.0 and its consequences. Artificial technology has reached a level where it is capable of substituting more and more jobs. This has a significant business value since productivity and efficiency increase through eliminating the factor of human mistakes. But what makes the topic of industrial robots controversial is that, according to several experts, they will have a negative effect on the labor market and will cause massive job loss worldwide. Robots might be beneficial for business owners, but is it worth applying them if they have such an impact on society? The situation might not be as bad as it first seems, though. 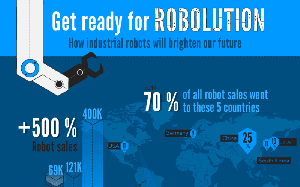 Check out TradeMachines’ new infographic to find out more about the positive impact of Industry 4.0 on jobs! Taking a closer look at the subject, we can find statistics that indicate a much better outcome than we’d first think. Click on image to see full infographic.